The Book of Mormon presents itself to the world as a miracle and as a sign that God has begun the process of gathering scattered Israel, as He anciently covenanted to do (see 3 Nephi 21:1–4; 29:1). For this and other reasons, many people have naturally been interested in the details of its coming forth, including the timing of its translation. 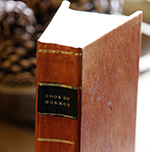 Various historical sources combine to prove that the English text of the Book of Mormon (as it was published in 1830) was essentially translated between April 7 and June 30, 1829. Fortunately, ongoing research has expanded and refined our understanding of many things that happened during and around these crucial three months. Drawing upon this research, the following summaries demonstrate why people can be confident that the vast majority of the Book of Mormon was translated within that narrow window of time. Compelling data confirm the dates of five key events during the translation timeline. Regarding the first, Oliver Cowdery stated that he first arrived in Harmony, Pennsylvania, in the evening of April 5, 1829, that he helped Joseph with “some business of a temporal nature” on April 6, and that on the very next day, April 7, he “commenced to write the Book of Mormon,”1 as Joseph’s scribe. Remarkably, a legal document discovered not long ago at a county courthouse near Harmony, Pennsylvania, bears Oliver’s handwriting and signature. It demonstrates that he served as a witness to an agreement dated April 6, 1829, between Joseph Smith and his father-in-law, Isaac Hale. On that day, Joseph purchased property from Hale on which stood the log cabin that Joseph and his wife Emma were living in.2 Oliver’s signature confirms that he was indeed with Joseph in Harmony on April 6, 1829, and now we know the nature of that notable “temporal” matter that he helped Joseph with on that precise day. April 7 Oliver Cowdery began working as Joseph’s scribe. May 15 John restored authority to baptize per 3 Nephi 11. May 31 The title page was completed. June 11 The Book of Mormon’s copyright was filed. June 30 The translation was completed. Thirteen revelations, each included in the Doctrine and Covenants, as well as a document called the “Articles of the Church of Christ,” were written during the time when the Book of Mormon was being translated. Not only do some of the words in those revelations correspond to details in historical reports of certain events during April, May, and June 1829, but in several cases they reflect words or ideas found in the Book of Mormon translation itself. This suggests that as the content of the Book of Mormon was received, further revelations and inspiration may have built upon what had just been revealed in its pages. April 6 About this time, D&C 6 was received, directed to Oliver Cowdery, as he began serving as Joseph Smith’s scribe. April 9 Mosiah 8–11 About this time, D&C 8 was received, directed to Oliver, about the power to translate. Compare Mosiah 8:11–16, speaking of King Mosiah’s power to translate. April 26 Alma 39–40 About this time, D&C 9 was received (compare D&C 9:14, “a hair of your head shall not be lost, and you shall be lifted up at the last day,” with Alma 11:44; 40:23). May 30 Moroni 5–8 About at this point, D&C 12 was received, directed to Joseph Knight Sr. (compare D&C 12:8, “full of love,” “faith, hope and charity,” with Moroni 7:1; 8:14). May 31 Moroni 9–10and title page About this time, D&C 11 was revealed, directed to Hyrum. Compare D&C 11:16 (“my gospel”), and D&C 11:25 (“deny not”) with Moroni 10:8, and the previously translated 3 Nephi 27:21. June 4 Traveled to Fayette and unpacked. About this time, D&C 10was finalized, telling Joseph to translate the plates of Nephi (D&C 10:41). June 7 1 Nephi 7–9 About this time, John and Peter Whitmer Sr. were baptized, and D&C 15 and 16 were received. June 8 1 Nephi 10–12 About this time, D&C 14 was given for David Whitmer. June 9 1 Nephi 13–16 About this time, D&C 18 was received (compare D&C 18:20, “church of the devil” with 1 Nephi 14:10). 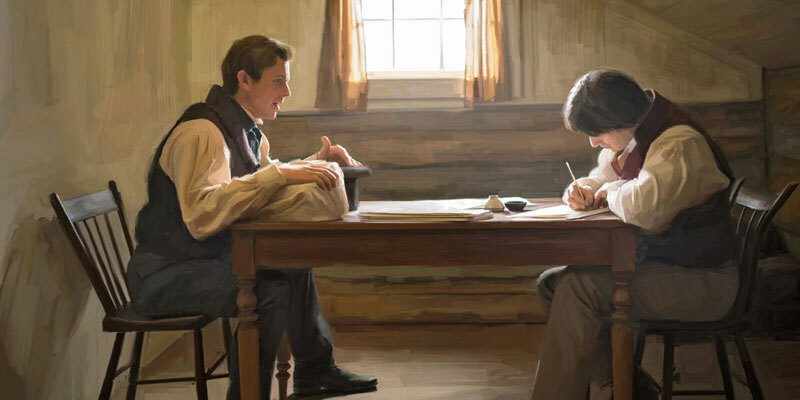 June 21 About this time, Oliver Cowdery composed the “Articles of the Church of Christ.” This document quotes extensively, verbatim, from the Original Manuscript of 3 Nephi 9:15–16, 18; 11:23–27, 32, 39–40; 18:22, 28–33; 27:8–10, 20; Moroni 3:1–4; 4:1–2; 5:1–2; 6:6; and also from D&C 18:4, 22–25, 31, 34. June 22 2 Nephi 28–31 About this time, D&C 17 was received, authorizing Oliver, David, and Martin to obtain a view of the plates (D&C 17:2; compare 2 Nephi 27:12). Estimated rates of translation needed for the proposed timeline. 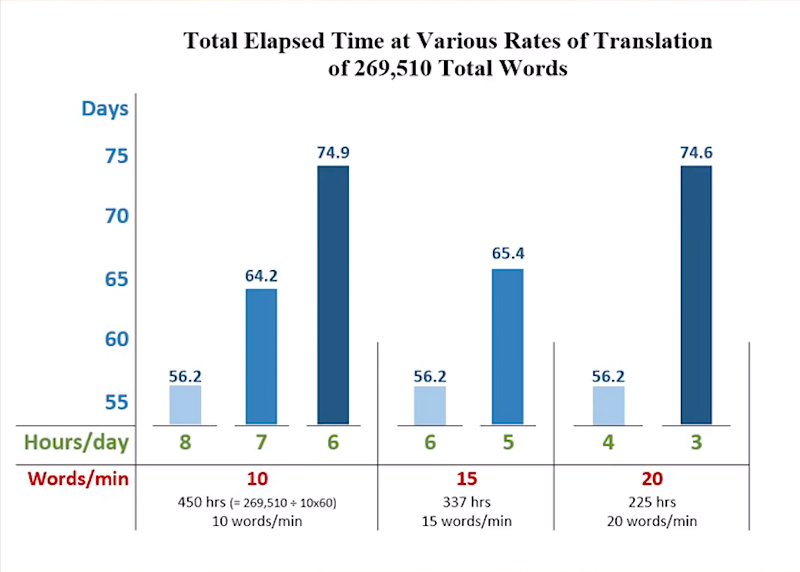 Their combined results, while not strictly scientific, suggest “that a translation rate of right around 20 words per minute was quite possible.”18 Yet those who participated also felt that they couldn’t have sustained that pace very long without time for breaks. They reported, “Our hands got tired, and the one playing Joseph needed to catch his or her breath and clear his or her voice.”19 Moreover, they were using ballpoint pens, whereas Oliver Cowdery would have often needed some time to dip his quill pen and refill it with ink.20 Thus, while it is difficult to determine exactly how quickly on average the translation was carried out, it reasonably fell within the needed estimated range (10–20 words per minute) in order for the entire project to have been completed between April 7 and June 30. This recent data and analysis demonstrate “that the historical documents relating to this somewhat obscure chapter in early Latter-day Saint history interlock more accurately than might otherwise have been expected.”21 As a result, readers can now trust, better than ever before, that the Book of Mormon was truly dictated in an astonishingly short amount of time. John W. Welch, “Timing the Translation of the Book of Mormon: ‘Days [and Hours] Never to Be Forgotten’,” BYU Studies Quarterly 57, no. 4 (2018): 10–50. John W. Welch, “April 7th and the Commencement of the Translation of the Book of Mormon,” BMC Conference, April, 2018, online at bookofmormoncentral.org. John W. Welch, “The Miraculous Timing of the Translation of the Book of Mormon,” in Opening the Heavens: Accounts of Divine Manifestations, 1820–1844, 2nd edition, ed. John W. Welch (Salt Lake City and Provo, UT: Deseret Book and BYU Press, 2017), 79–125. Richard Lloyd Anderson, “The Credibility of the Book of Mormon Translators,” in Book of Mormon Authorship: New Light on Ancient Origins, ed. Noel B. Reynolds (Provo, UT: Religious Studies Center, Brigham Young University, 1982), 213–237. 1.Oliver Cowdery, “‘Dear Brother’ [Letter 1],” The Latter Day Saints’ Messenger and Advocate, October 1834, 14, online at archive.bookofmormoncentral.org. For further information concerning these events, see John W. Welch, “The Miraculous Timing of the Translation of the Book of Mormon,” in Opening the Heavens: Accounts of Divine Manifestations, 1820–1844, 2nd edition, ed. John W. Welch (Salt Lake City and Provo, UT: Deseret Book and BYU Press, 2017), 100–101. 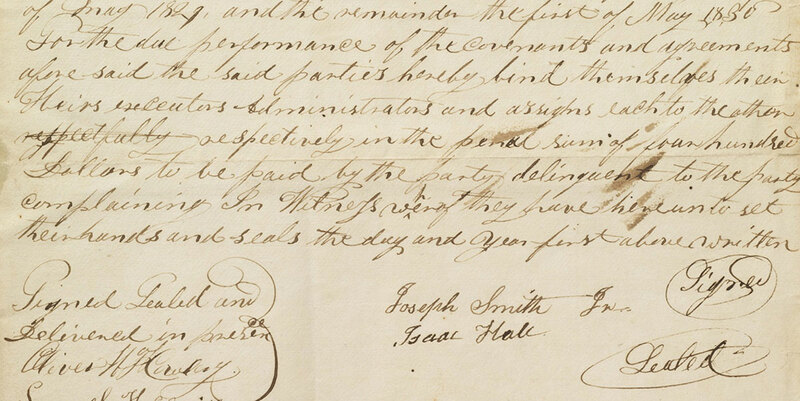 2.“Agreement with Isaac Hale, 6 April 1829,” p. 1, The Joseph Smith Papers, accessed November 6, 2018, online at josephsmithpapers.org. 3.See John W. Welch, “Timing the Translation of the Book of Mormon: ‘Days [and Hours] Never to Be Forgotten’,” BYU Studies Quarterly 57, no. 4 (2018): 16–30; the following chart was adapted from pp. 45–49. 4.See Welch, “Timing the Translation,” 34–37; the following chart was adapted from pp. 45–49. See also Patrick A. Bishop, Day after Day: The Translation of the Book of Mormon, 2 ed. (Salt Lake City, UT: Eborn, 2018), whose analysis sometimes agrees and sometimes differs from Welch’s analysis, but overall is much to the same effect. 5.See “History, circa Summer 1832,” p. 6, The Joseph Smith Papers, accessed November 7, 2018, online at josephsmithpaper.org. 6.See “History, 1838–1856, volume A-1 [23 December 1805–30 August 1834],” p. 18, The Joseph Smith Papers, accessed November 7, 2018, online at josephsmithpaper.org. 7.“History, 1838–1856, volume A-1 [23 December 1805–30 August 1834],” pp. 20–21, The Joseph Smith Papers, accessed November 7, 2018, online at josephsmithpaper.org. 9.Richard Lloyd Anderson, “The Credibility of the Book of Mormon Translators,” in Book of Mormon Authorship: New Light on Ancient Origins, ed. Noel B. Reynolds (Provo, UT: Religious Studies Center, Brigham Young University, 1982), 218. 10.See Welch, “Timing the Translation,” 32–33. 11.See Anderson, “The Credibility of the Book of Mormon Translators,” 217–220. 12.See Welch, “The Miraculous Timing,” 118–125. 13.Welch, “Timing the Translation,” 34. 14.See Terryl L. Givens, By the Hand of Mormon: The American Scripture that Launched a New World Religion(New York, NY: Oxford University Press, 2002), 37. 15.Welch, “The Miraculous Timing,” 119. For these purposes, Oliver Cowdery’s statement that he “wrote with [his] own pen the intire [sic] book of Mormon (Save a few pages) as it fell from the Lips of the prophet,” in Welch, Opening the Heavens, 159, is taken as the best evidence that only about eight manuscript pages, if that many, were written by Emma or perhaps others before Oliver began working as scribe on April 7. Bishop, Day after Day, would increase that number. Either way, the resulting overall timeframe is very tight. 16.Welch, “Timing the Translation,” 37. 17.Welch, “Timing the Translation,” 38–39. 18.Welch, “Timing the Translation,” 39. 19.Welch, “Timing the Translation,” 39. 20.Welch, “Timing the Translation,” 39. 21.Welch, “Timing the Translation,” 43. 22.See Royal Skousen, The Original Manuscript of the Book of Mormon (Provo, UT: FARMS, 2001), 35–36; Welch, “Timing the Translation,” 22. 23.See “Book of Mormon, 1830,” p. 588, The Joseph Smith Papers, accessed January 29, 2019, online at josephsmithpapers.org. 24.See Book of Mormon Central, “Why Was a Stone Used as an Aid in Translating the Book of Mormon? (Alma 37:23),” KnoWhy 145 (July 18, 2016); Book of Mormon Central, “Were Joseph Smith’s Translation Instruments Like the Israelite Urim and Thummim? (Alma 37:24),” KnoWhy (March 20, 2018); Book of Mormon Central, “Is There Evidence That Joseph Smith Possessed a Urim and Thummim and Breastplate? (Ether 4:5),” KnoWhy (February 20, 2018). 26.a. b. See Book of Mormon Central, “Why Did the Book of Mormon Come Forth as a Miracle? (2 Nephi 27:23),” KnoWhy 273 (February 10, 2017). 27.Welch, “Timing the Translation,” 41. 28.Welch, “Timing the Translation,” 41–44. 29.Welch, “Timing the Translation,” 44.